You will earn 2,827 Reward Points. Earn 1 reward point for every 1 dollar spent. 8" extended conveyor load-up area in top toaster. 6" extended conveyor load-up area in bottom toaster. 24 hours 7 days a week technical support by Star technicians. Product entry opening 1-3/4" high (not adjustable) in bottom toaster. Product entry opening adjustable from 1" to 2-1/4" high in top toaster. Two variable speed conveyor belt controls for perfect color and texture. Two sets of separate, top/bottom variable heat controls for a variety of products. Double toaster - two full size toasters with individual controls in less than 20" of counter space. There is no need to keep both toasters running during slow periods. Combining two toasters into one enables the operator to make efficient use of counter space. With our quartz infrared heaters, turn one toaster off and bring it back to full power in seconds. 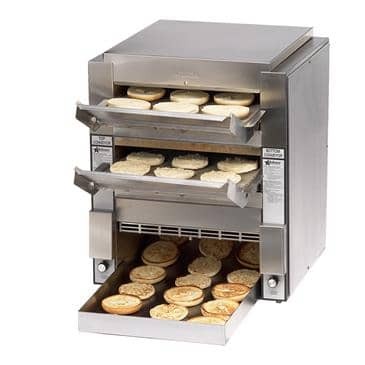 Energy efficient and flexible, the DT14 dual-conveyor belt toaster is designed for food service operators who need one toaster that can toast two different bread products at the same time. Stainless steel construction for long lasting durability. Toasters are furnished with 1" adjustable legs and 4' cord. Conveyor belt tension system for smooth and quiet operation. Heavy-duty motor, drive chain and conveyor speed control for superior reliability. Star designs every toaster to stand up to the most rigorous foodservice demands. High performance Quartz Infrared Heaters for superior toasting performance and reliability. Conveyor toaster is constructed of corrosion resistant stainless steel. Two variable speed conveyor belt controls and two separate top and bottom heat controls. Two conveyor belt tension systems are supplied for a smooth, quiet operation. 8" and 6" extended load up areas, product openings of 1” to 2-1/4" and 1-3/4" high and large holding area. Crumb tray, hi-limit switch and quartz infrared heaters are standard. 1" adjustable legs and a 4' cord. Units are listed with UL, CSA certified and NSF approved. Printed in the U.S.A. Able to toast a lot at one time. Very speedy and helpful in the busy kitchen. We've only had it for a short time but it seems very high quality so far.